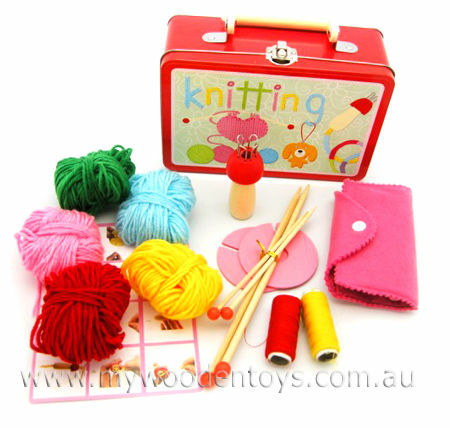 Knitting Kit Wooden In Tin Suitcase is a wonderful set of knitting accessories beautifully presented in a pink tin suitcase. a felt purse with a tape measure, one pair of pink scissors, three embroidery needles and a crochet hook. This set also comes with an instruction sheet which shows you how to make Pom Poms, use the French Knitter and gets you started with basic knitting and crochet. A brilliant set filled to the brim with everything knitting. We like this because: "Excellent value very well thought through toy"